There’s a good chance you may have read it in school but just like many other books over the past few decades, The Handmaid’s Tale by Margaret Atwood has seen a fresh surge in popularity thanks to a TV adaptation of the same name. The show recently cleaned up at the Emmy Awards with 13 nominations and 8 wins. The story is told through the character of Offred, a woman trapped in a post-civil-war world where a totalitarian government called “Gilead” has taken over the USA. With infertility at an all-time high, one of the top priorities for the new regime is increasing the birth rate. Like many other fertile women, Offred is forced to serve as a handmaid to bear children for a powerful Gilead couple, Commander Fred Waterford and his wife, Serena Joy. Needless to say, The Handmaid’s Tale deals with some pretty grim themes including oppression, corruption and violence, so it’s definitely one to watch when the kids aren’t around. Once we started watching this gripping tale, we were hooked, so we’ve done some sleuthing to uncover six things you may not have known about the series to help you get excited, too! This one isn’t really a spoiler, honest – it’s one of first things you’ll hear when you start watching. In the book, however, we’re never explicitly told Offred’s name; only a list of names exchanged between the girls at the Red Centre, where handmaids are educated: “Alma. Janine. Dolores. Moira. June.” The only name not linked to another character in the book is June, so it’s implied that June must be the protagonist. Once she’s forced to become a handmaid, however, her name becomes Offred and using her real name is forbidden. What you may not have noticed is this quite literally means “Of Fred”, which is the name of the Commander. Move over, Stan Lee – Margaret Atwood can do cameos, too! In an episode where Offred gets slapped across the face, the one doing the slapping is none other than Atwood! Elisabeth Moss, the actress who plays Offred, was actually keen as beans to get a slap from the renowned author and even though it was only her hand in focus, we think it was some solid acting. Originally, The Handmaid’s Tale was set in the 1980s-1990s but since then, technology has seriously changed the way we interact socially, run business and complete day-to-day tasks. 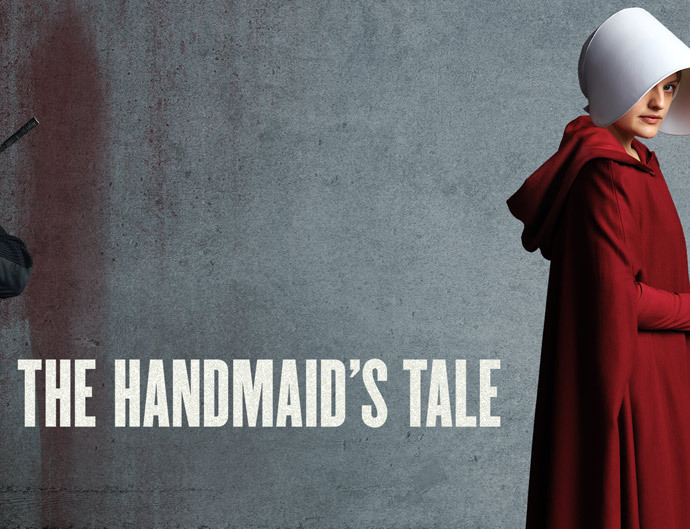 The TV series has adjusted the story for this, particularly in the flashbacks of the life Offred lived before Gilead took over. We see the characters using smartphones and internet banking, just like us – which makes what happens in Gilead all the more disturbing. At first glance, Offred’s room may seem like a simple, sparsely-furnished room, but the production team added some careful touches to bolster the austere reality Offred now lives in. Vanity is frowned upon, so the wall also has an outline of a mirror that has been removed. The room also has a desk, but in Gilead, women are forbidden to write. When Offred was still June Osborne, she was a writer and editor, so this is a particularly painful reminder of her old life. The clever use of cinematography and angled shots in The Handmaid’s Tale creates some amazing atmospheres full of tension and austerity, but you may have missed one subtle technique. In a scene where we see a close up of a woman’s face when she is distressed and confused, even the viewer may feel like something is terribly wrong just by looking at her. That’s because her image has been mirrored – the human eye can tell when something looks a bit off and it automatically makes you uneasy. 6. There’s still more to come! While the first season of the TV series largely stayed true to the book (which has an ending that honestly left us all desperate for closure) a second season of Handmaid’s Tale has already been confirmed. This isn’t the first time a book-based TV series has endeavored to go “off-book” (you’ll know what I’m talking about if you’re a fan of Stephen King’s Under the Dome) and it’s always interesting to see how the writers will take the characters to new and exciting places, especially when the original authors are involved in the creative process. We’re sure season two will be just as enthralling! You can catch up on The Handmaid’s Tale online thanks to SBS on Demand for the rest of October. If you missed out, Fetch TV customers can pick up season one from the Fetch TV Store for $24.99AUD so you can watch and re-watch anytime from the comfort of your lounge room. Just use your Fetch remote to open the Fetch menu, select the magnifying glass icon in the top-right corner and search for “handmaid”. Do you have a great TV show to recommend? Tell us about it in the comments. I love that you do these little flash pieces. Very interesting. And the little box about your employee Gina Thompson is a good touch. I was born in Canada and read the book twenty years ago. Margaret Atwood did well with this book, but unfortunately I did not like any of her later books – she had a problem in starting a book to keep people interested. I have doubts whether she will do a good job with a sequel to this book. Sorry about that Margaret – but that’s what I believe. P.S. – I too am an author. Thanks for the HM’s info! Interesting! Foxtel. Watched the first season on 10 and loved it, and was looking forward to Season 2. Very disappointing. How much longer before we can continue the series? I agree fully with Roberta & Gai….Another series I found profoundly moving was “Rectify” on ‘free to air’. Has it ever been completed?